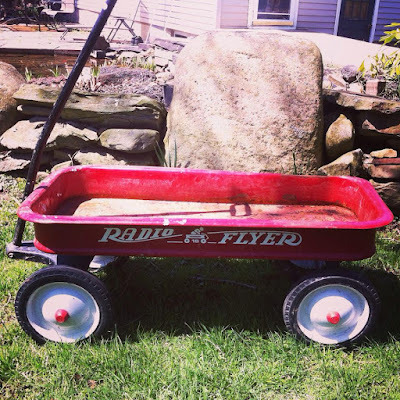 Earlier this Spring, I found an old Radio Flyer wagon at a yard sale. My husband was so excited because ever since he found out I was pregnant last Spring, he had been searching for project ideas for our little one. He told me to keep an eye out for a wagon and this is what I found. As you may remember from a previous post, my husband has been working on a "rat rod" truck for us to all enjoy and take to car shows. His project has been a slow work in progress. However, Piper's first "rat rod" wagon has already debuted when she went to her first car show last weekend! My husband isn't completely done with the wagon, but it was done enough for our first car show of the season! People were asking us if they could take pictures of the wagon and yelling out compliments as we passed. My husband was one happy guy and my daughter is one lucky girl. She has the coolest dad I know. Since we're talking about Piper, I might as well share a few more pictures of the little sweetheart. Right? After the car show, we stopped to take a couple pictures of Piper since she was awake and it was so nice and warm out. The place where we took these pictures is special. My husband and I are high school sweethearts and we both remember walking home from school down this lane of trees. We remember how these trees were so small back then. They are full grown now, as are we, and there we were, standing with our daughter in hand under those same trees. Life in our small town where we grew up is so, so sweet. Please note: dad gets the smiling picture and she sticks her tongue out in both of mine. I'm not jealous or anything. Readers, have you ever been to a car show? What's a special place you still get to visit from when you were a child?